King Sunny Ade was born into Nigeria's Ondo royal family, but rebelled against the contraints of his background by dropping out of school and becoming a musician -- an occupation held in very low regard in his homeland. 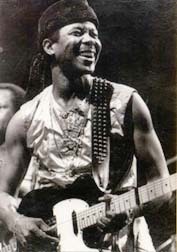 He built up a reputation working with several juju bands in Lagos (juju being a guitar-based musical style popular in Nigeria) before finally forming his own band, The Green Spots, in 1964. Already hugely popular in Africa, Ade began to gain attention in Europe and the States during the surge of interest in "world music" that took place in the early 1980s. He has used the monies gained from his popularity to establish a wide variety of business interests.